H-E-B Has a contest going on called H-E-B Holiday Meal Pin to Win Sweepstakes Tell H-E-B what's on your holiday table this year by entering the H-E-B Holiday Meal Pin to Win Sweepstakes for a chance to win a $1,000 H-E-B Gift Card.Hurry you only have until December 31, 2012. Here is a great H-E-B recipe we had with our Christmas dinner! 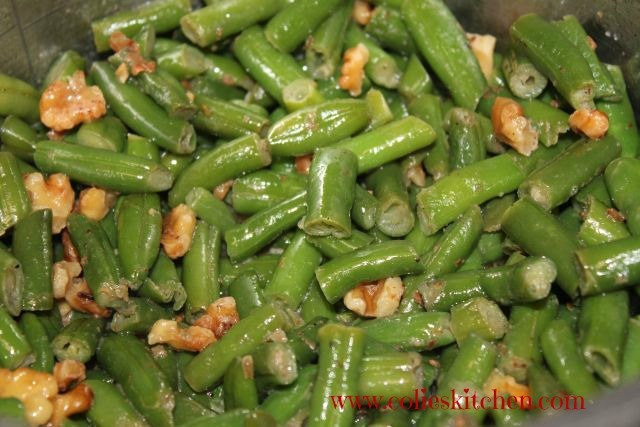 It’s a fun, simple recipe that takes the basic green bean and turns it into a gourmet dish. The best part about this side dish is it’s quick and delicious. Don’t forget to enter the H-E-B Pin and Win Contest!! Bring 2 quarts salted water to boil in a 3-quart pot. Add green beans and cook 3 to 5 minutes or until crisp-tender. Pour into a colander to drain. Meanwhile, melt butter in a large skillet over medium heat. Add oil. Toast walnuts in butter and oil 2 minutes, stirring often.